T his book review is on the first book I read for the book club I started going to in town. It is called “Leaving Time” by Jodi Picoult. Now, I have to give you a disclaimer on my view of the author. I believe that she is the Steven Seagal of the literary world. Meaning, all or most (since I have not read every one of her books) ‘preach’ on whatever current advocacy group she is rallying for. In this instance with the book, it is elephants. The book is about a young girl, Jenna, who partners with a psychic, Serenity, and retired detective, Virgil, in the search of what happened to her mom many years ago on a night that a murder and the mom’s disappearance occurred. It is written in the first person format which I personally do not enjoy, but many do. 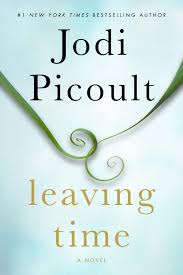 Jodi Picoult dedicates each chapter from one character’s point of view throughout the book: it may be Jenna’s view in one chapter, then Virgil’s view in another, etc. The book teaches you a lot about elephants and their lifestyle, specifically on the grieving process. The book compares how humans and elephants grieve differently and also how the maternal instinct in an elephant is similar to that of most humans. I love learning new things and so this did not bother me, but some do not like to feel they are being ‘taught a lesson’ when trying to enjoy a book. That is not me, teach away, dear author! Many of the characters in the book seemed to be an afterthought to me, as if the author was writing them in to get to the next point she wanted to write about. Now, I like a book that makes me get emotionally attached to each character, because it is after all the characters who make up the entire story, so this aspect of the book left me wanting more. The book kept my interest throughout until about 7/8 of the way through. Then, it seemed that the rest of the book was rushed, as if the author had a deadline to make and was pushing the envelope. I personally feel that books and the characters inside evolve during the writing process and seem to write their own ending. Rushing through an ending seems wrong on so many levels to me. Overall, Leaving Time by Jodi Picoult was a nice read and I give it 3 out of 5 bookmarks (my version of stars) and do recommend it to people who want an entertaining learning experience.